We all have our reasons for joining (or not joining) social media. The prospect of missing family photos was my motivation for joining Facebook. Despite my initial reluctance, I’ve come to enjoy its entertainment value—catching up with former colleagues and old classmates, frequent opportunities to see all things adorable in my News Feed (e.g., kittens, puppies, bunnies, babies), and the occasional inspirational or funny meme. As much as I’ve come to enjoy its entertainment value, the ability to get news from all my favorite sources in one place has me checking my account throughout the day. According to Pew Research Center, I’m certainly not alone. Roughly two-thirds of adults in the United States (64 percent) get news from Facebook followed by YouTube (10 percent) and Twitter (8 percent). Increasingly, however, its benefits are significantly outweighing its flaws for older adults who are the fastest-growing population on social media. 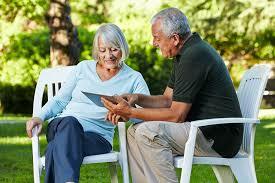 In fact, 35 percent of adults over the age of 65 report they have joined social media. As Anita Kamiel, founder/owner of David York Home Healthcare Agency, explains, “While their younger counterparts use social media in a ‘selfie’ sort of way, the elder, who are very sensitive to privacy issues, use it to connect with like-minded individuals.” Studies also show that social media is helping to reduce issues such as loneliness and depression among seniors, which attributes to a faster decline in health and a greater risk of mortality. More seniors are opting to stay at home for as long as possible, so social media not only enables older adults to maintain and form new social connections but also can serve as a useful portal in which to learn about services available to seniors. While most people are aware of the Medicare program, which is the federal health insurance program for people over the age of 65 years old, those disabled and receiving Social Security cash benefits, and those suffering from end-stage renal disease (ESRD, or kidney failure), seniors commonly complain that understanding its parts and the application process is both daunting and confusing (Part A is the Hospital Insurance [HI] program, Part B is the Supplementary Medical Insurance [SMI] program, Part C allow beneficiaries to enroll in managed care organizations such as health maintenance organizations [HMO] and preferred provider organizations [PPO] as an alternative to the fee-for-service program, and Part D is the outpatient drug benefit). Social media can ease the confusion by initiating live Q&A sessions so applicants can ask questions in real time or read questions posed by others, which could encourage followers to chat about their experiences with applying and maintaining coverage. In addition to learning about accessing national programs, social media also can introduce and help seniors access local programs that provide services such as transportation, bill assistance, fitness classes, and, in some communities, free pet food for seniors who receive homebound meals and cannot afford to house a pet. As the number of social media sites continues to increase (for example, the number of active Facebook users has almost reached 2 billion), there is still much to learn about its users, especially senior citizens who experience social media differently than the younger generation. Seniors are leading the path in understanding a new category of social media users who view social media as a way to connect to educational and informational content. In return, social media is helping seniors to become more informed about the many resources available to them. Author: Bianca Easterly, Ph.D., MPA is an assistant professor in the department of political science at Lamar University. Dr. Easterly teaches undergraduate political science courses and graduate seminars in the Master of Public Administration program. She can be reached at [email protected].